An unusual wave that does not spread out as it travels could become a key component in speedy computer chips that use beams of light to carry and process data. Jiao Lin, a physicist at the A*STAR Singapore Institute of Manufacturing Technology, helped to develop the electromagnetic wave, which can travel some 80 micrometers in a straight line without diffracting. The wave is formed when light hits the surface of a metal, creating ripples in the sea of electrons there. Under certain conditions, the ripples—known as surface plasmons—can couple with the incoming light to create electromagnetic waves that stick tightly to the metal surface as they travel. Known as surface plasmon polaritons, these waves have a shorter wavelength than the light, which makes them more attractive as data carriers. Although light can zip around a computer much faster than electrons, optical components tend to be much larger than those in conventional circuits—their size is dictated by the wavelength of the light they handle. Using surface plasmon polaritons offers the best of both worlds, explains Lin, because the signals can travel at the speed of light along metal waveguides that are as compact as conventional circuits. Unfortunately, surface plasmon polaritons diffract as they travel over the metal, which erodes the quality of the signals they carry. Previous attempts to prevent this diffraction were moderately successful, but caused the polaritons to veer off course. The wave developed by Lin and co-workers is a previously unknown solution to Maxwell's equations, which describe how electromagnetic fields behave. Once the team had formulated a mathematical description of this wave, known as a localized cosine-Gauss beam, Lin helped to turn it into a reality. The team carved two sets of tiny grooves, each roughly 10 micrometers long, into a thin layer of gold stuck to a glass backplate. They slightly angled the grooves to make a chevron pattern (see image). 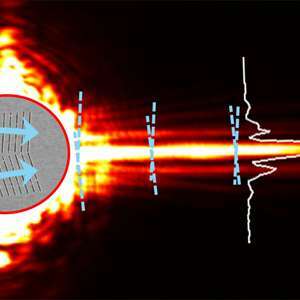 Shining near-infrared laser light at the grooves generated two surface plasmon polaritons that soon converged and interfered constructively with each other. This resulted in a tightly focused beam that skimmed across the gold without diffracting, covering a much greater distance than previous efforts had achieved. The team tracked the narrow beam as it traveled over the surface using a near-field scanning optical microscope. Lin says that as well as helping to create faster and more energy efficient computers, the beams could also be used in the laboratory to trap and manipulate nanoparticles. The wave developed by Lin and co-workers is a previously unknown solution to Maxwell's equations, which describe how electromagnetic fields behave. Once the team had formulated a mathematical description of this wave, known as a localized cosine-Gauss beam, Lin helped to turn it into a reality. Why is this appearing on physorg in May, 2013, when the PRL article appeared in Aug, 2012?